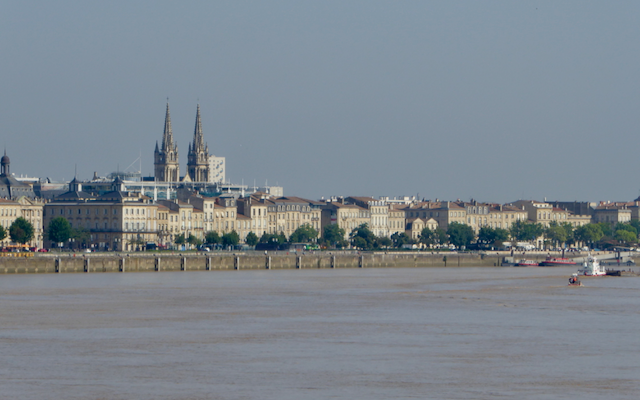 It's the beginning of July and we’re heading for Bordeaux. Touched down on a hot night, temperatures still up in the high 20’s and its 9.30pm. Luckily we find our apartment pretty swiftly after making friends with a nice young Englishman who spoke fluent French. 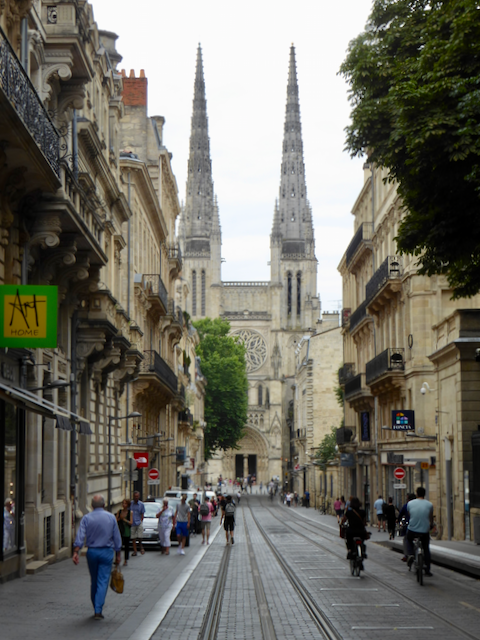 We’re soon relaxing and hearing all about Bordeaux , glass of wine in hand, and conversing like old friends. Our host Geraldine is a delightful university student who grabs every opportunity to practise her English and make us feel very home! 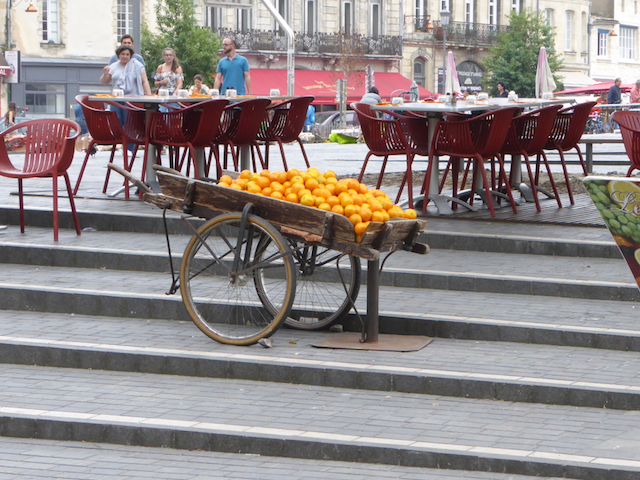 She’s gone first thing the next morning so the house is ours and we soon find the fresh food markets, boulangerie etc just around the corner. Back for a lovely leisurely breakfast of delicious fresh apricots and nectarines ( sweet yet sharp and tasty, slightly sunburnt and so juicy, just as I remember as a child), fresh French bread, butter, homemade jams and coffee. So simple yet so good, and why does it seem to taste so much better when in France?? 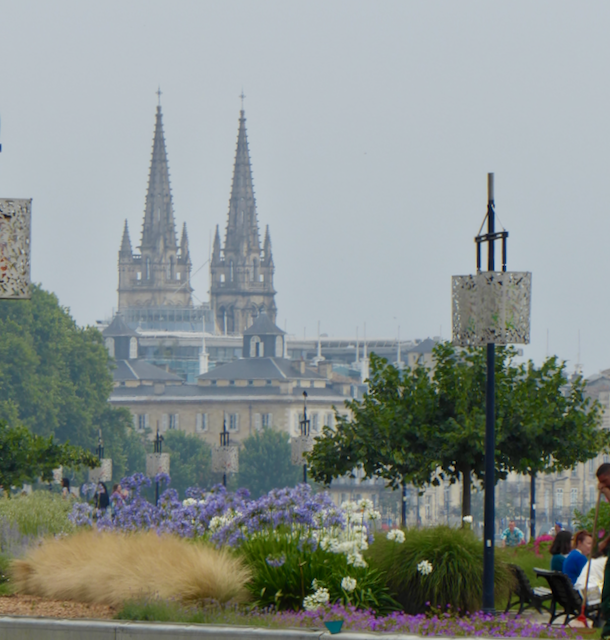 We spent a couple of days exploring Bordeaux, France’s sixth largest city and now the worlds largest Urban World Heritage site. Being the centre of this famous wine making area, the city has always drawn the crowds. But over the last twenty years it has had a facelift, from a rather scruffy unkept city, to an elegant, almost graceful and vibrant city with world class architecture. The picturesque riverfront and former port would have to be my favourite part of the city. 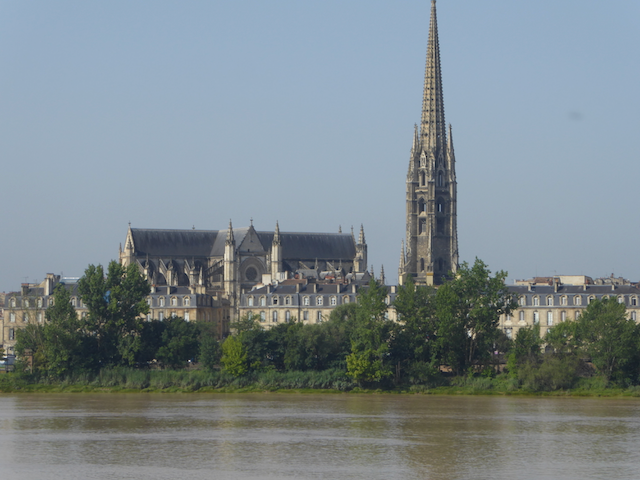 With its stunning 18th century buildings that stretch for over 3 kilometres along the Garonne River. Once a lively Roman trading centre, the river has been its lifeline since birth but not too many years ago it was a no go zone, littered with derelict warehouses and lost souls. But not now!! 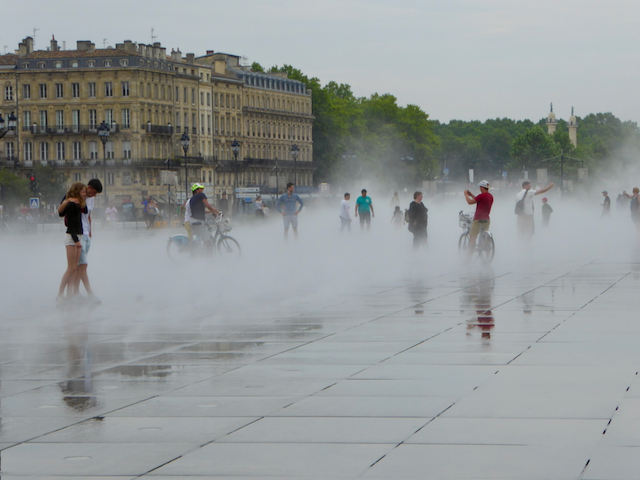 Even the new Water Mirror, a 2cm deep pool on a slab of granite, thats either producing a fine mist of water or a tranquil mirror, didn’t detract from the elegant symmetry of the Place de la Bourse. In fact, in this heat it attracted masses of people especially the young ones wanting to cool down. 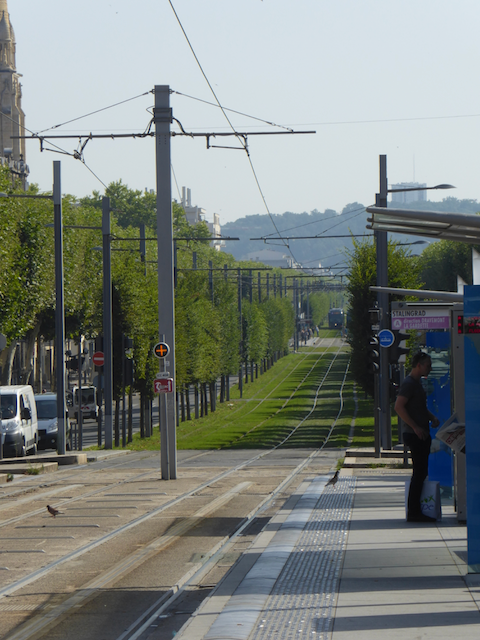 The wonderful tree-shaded boulevards were also a blessing in this weather. 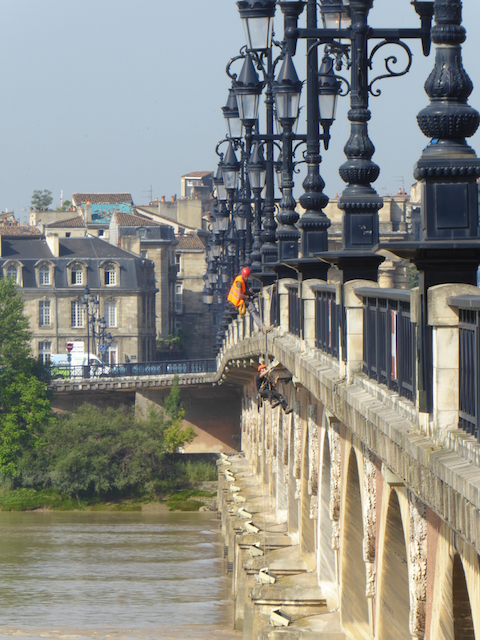 Further down the river we wandered across the impressive Pont de Pierre - Stone Bridge. Commissioned by Napoleon but not built till 1820, this elegant bridge was the only means of crossing the Garonne River for over 150 years. Best place to get a stunning view of the riverscape and quays. Geraldine our delightful host recommend La Toque Cuivree on the Place Gambetta as having the best Canneles in the city - they were delicious, worth walking for! Known for its wine, it also had some great cafes but our favourite turned out to be a small tent just near the market. Not only smooth strong coffee but the most delightful owner, who was very keen to converse and made our day! From Bordeaux we trained to Agen then over to a small rural town of Nerac. Not a lot of public transport as we soon discovered but worth slowing down and enjoying the wait. 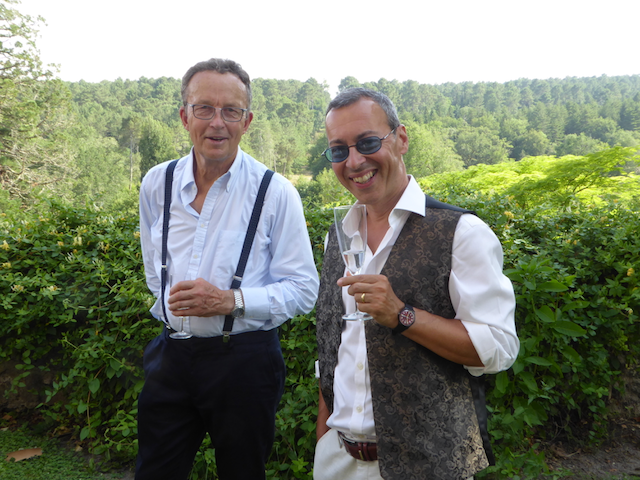 Our travelling mates, David and Judy, were hosting their eldest daughters wedding her in Nerac at a glorious Chateaux. 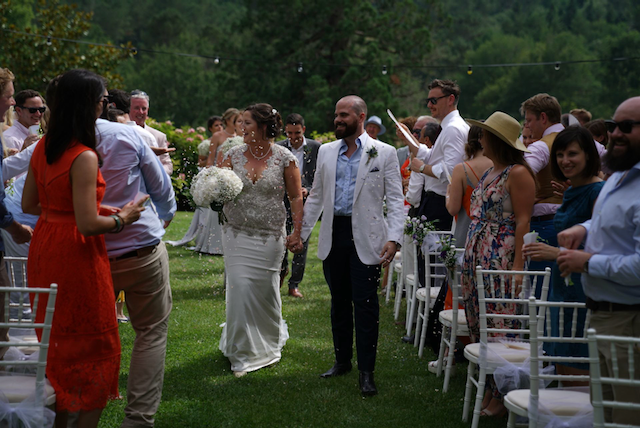 They’d booked the whole place out for three or four days, of wonderful celebrations and lots of laughter. A handful of us stayed in the classic French BnB in Nerac. Our hostess was a bit grumpy and over come with a full house but soon softened and turned out to be quite a character. She prided herself on the years and years of service that she had put into the place and . Breakfasts always meant an early start for her as she had a good walk over the other side of the river to the ‘ right’ boulangerie for the fresh bread and pastries. Served on a long table out on the cobble stoned courtyard with her homemade jams, butter, prunes etc and plenty of coffee. 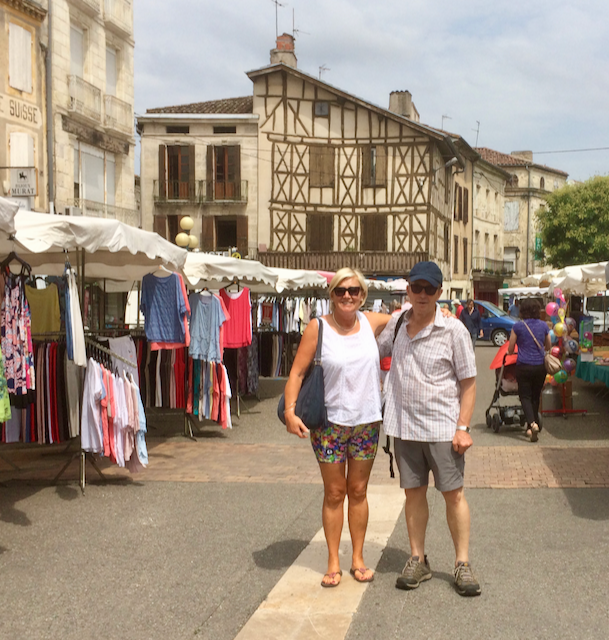 We stumbled upon a great market in the centre of the village and then spent the morning in a bar watching rugby with a handful of locals. They were delighted to have some new enthusiastic rugby followers on hand, especially when they discovered we were cheering for the All Blacks and not the Lions!! Then off to a wonderful Wedding and next day trained back to Toulouse then flew to Gatwick before repacking and heading to Scotland in the mighty Punto!